A human rights lesson on wheels is in Windsor over the next seven days to get local students on board with diversity and democracy. 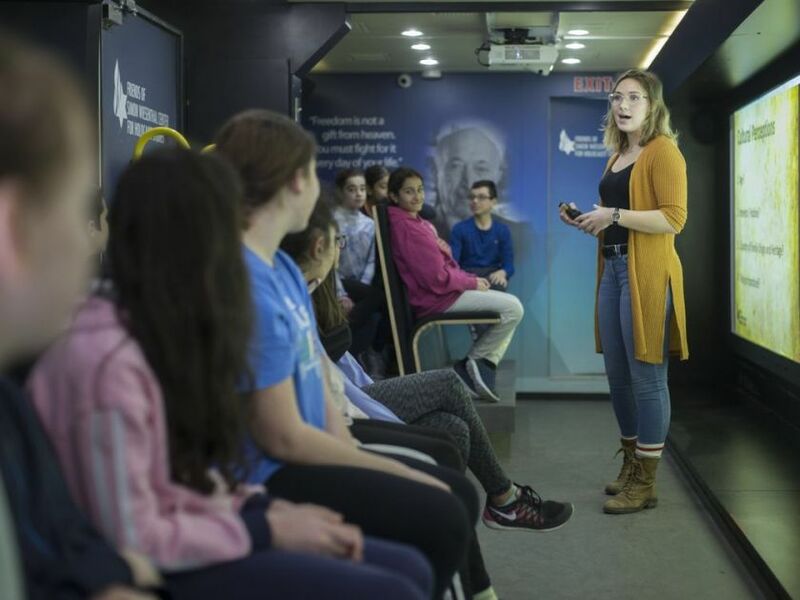 The Tour for Humanity bus, which comes from the Toronto-based Friends of Simon Wiesenthal Center for Holocaust Studies, will visit students from five schools in the region. The mobile classroom contains a state-of-the-art technological education centre with 30 seats, a dozen 55-inch LED screens and surround sound, and is wheelchair accessible. Its purpose is to empower people of all ages to promote justice and human rights and take action against hate, intolerance, and bullying. Since its launch in 2013, the Tour for Humanity has visited more than 600 schools across Ontario and provided mobile lessons to 100,000 students and educators. Simon Wiesenthal, a holocaust survivor who died in 2005 at age 96, spent much of his life gathering information on fugitive Nazi war criminals and tracking them down so they could be brought to trial. He wrote several memorials detailing his investigations and experiences in Nazi death camps. In 1977, the Simon Wiesenthal Center was founded in his name in Los Angeles, and it now has locations around the world.